The Nobel prize winning physicist, Richard Feynman, said that he didn't know if there was really a problem with quantum mechanics but if there was, it was a big one. He also suggested that if children were taught quantum concepts early, they might not have any problems at all with the theory. The Trojan Carousel, a novel, is the story of two schools, the Feynman Elementary School of Advanced Physics, and the affiliated Amdexter School, a traditional middle-grade boys boarding school. In particular, it is the story of Kip, a student at the Feynman school and his friend Alex, a student at Amdexter. This novel is very hard to categorize: it has a lot of science, but it isn't exactly science-fiction. It is written for both middle-school age kids and also for theoretical physicists. It could perhaps be compared to Harry Potter with magic replaced by physics, but it perhaps has more in common with Lord of the Flies. I've tried to tell a compelling tale and also to describe, to the uninitiated, some of the wonderfully incomprehensible features of quantum mechanics. 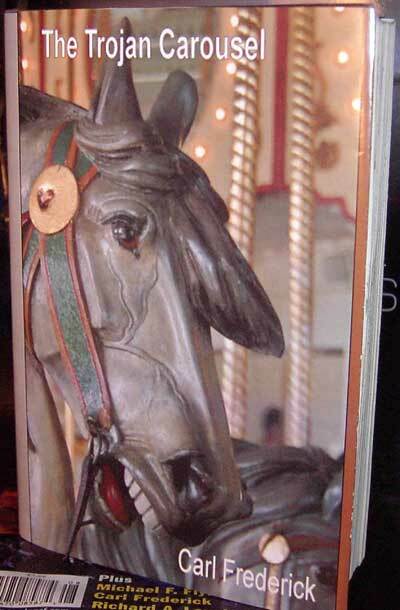 Due to both the unusual nature of the novel and also the current state of publishing, I think it might take a long time for The Trojan Carousel to find a good home. I would however, like to have people be able to read it before the next ice age. So I've decided to put the first half of the book up on my site (below), with the offer to e-mail the rest of the novel to anyone who requests it. [Just send me an e-mail at darkzoo@darkzoo.net (with WELF somewhere in the subject line to bypass my spam trap)]. Because the book is for (and about) science geeks, as a marketing tool, I created the Geek Card: a wallet sized card holding geekish data--pi to 60 places, the standard model of elementary particles, a functioning slide rule, chemical and astronomical information, physical constants, a geek joke (the punch line only understood by geeks) in Morse code, etc. Actually, one of the kid characters in the novel had created a very similar card and this geek card therefore seemed a natural tie-in. Since its creation though, the Geek Card has taken on a life of its own. Click here to go to the GEEK CARD page.